Earning a driver’s license is a milestone that signifies freedom and independence for teenagers – and worry for their parents. The summer months can especially be a dangerous time for young drivers, according to Chelsea Pompeani, director of public affairs for AAA East Central. Pompeani described the time between Memorial Day and Labor Day as the “100 deadliest days” for teen drivers. Distraction, she said, is the biggest risk for teen drivers – specifically in terms of cell phone usage and multiple passengers. According to Pompeani, crash rates increase with each teen riding in a vehicle. Pompeani suggested that parents turn off their own cell phones and put them away whenever they drive. Such actions, paired with regular discussions, can instill in teens that texting is “extremely dangerous” not only for themselves, but also for others on the road. Pompeani said it is crucial that teens “know that their parents are always there” when it comes to driving and any help they may need. She added that while summer can be a dangerous time for young drivers, it can also be ideal for teaching teens how to drive. Teens can gain valuable experience during those months, she said. But, she said, teens need to take driving seriously. “It only takes one crash for something astronomical to happen,” Pompeani said. Driver’s education classes, she added, can help teens better understand rules of the road. McCoy added that on average it takes about five years to become a good driver. As such, teens need to understand that “driving’s a wonderful privilege,” but not a right, McCoy said. “It’s something they have to continue to work for,” she added. She also discussed how driver’s education has changed. McCoy, who has been a driving instructor for about 20 years, said there is more criteria now. McCoy also said the classroom portion of driver’s ed can now be completed online. She added that the program has been “redesigned” for parents to have more time and opportunity to help their kids learn the rules of the road. McCoy recommended that parents remember that their kids are inexperienced. She said that while operating a vehicle is “not that difficult,” understanding the law and anticipating different situations can be. Like Pompeani, McCoy said parents have the potential to influence their children’s driving and that they should be aware of that impact. Ohio State Highway Patrol Lt. Stan Jordan also said that many of the precautions for teen drivers apply to “drivers of all ages.” He said everyone needs to “pay attention (and) drive defensively.” He added, “Teenage drivers need to remember to not drive fast, number one.” Making sure teens wear seatbelts, he said, is also vital. And while Jordan said that not all teen drivers drink and drive, he said that such behavior is “always a concern for us, too.” He also discussed the risks of distracted driving, both with cell phones and multiple passengers. Between the months of January and May of this year, Jordan said, Highland County saw a total of 19 crashes and six injuries involving drivers ages 18 and younger. Clinton County saw 50 crashes with 17 injuries and one fatality. In comparison, Highland County saw 45 crashes with 14 injuries in 2014, and Clinton County saw 44 crashes with 13 injuries. Last year saw a total of 191 crashes in both counties, with 63 injuries, Jordan added. 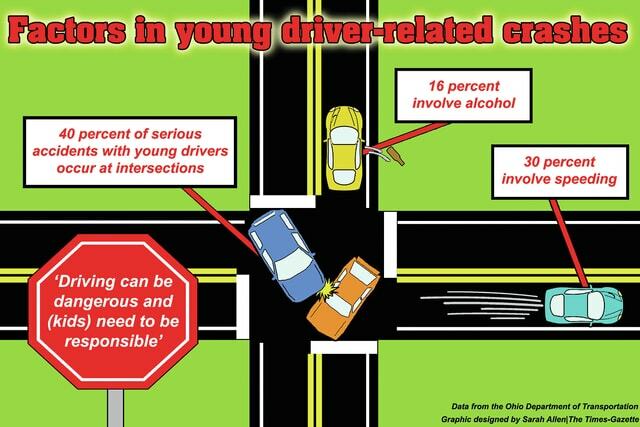 The Ohio Department of Transportation (ODOT) has also analyzed data concerning young drivers in its Strategic Highway Safety Plan (SHSP). Data from the SHSP shows Highland County had between 17 and 23 young driver-related deaths and serious injuries between 2008 and 2012 (the most recent data available). That number represented between 37 and 38 percent of all serious crashes in the county during those four years. Statewide, the SHSP reports that “young driver-related crashes accounted for 32 percent of Ohio’s deaths and 39 percent of serious injuries” between 2006 and 2012. The SHSP adds that nearly 40 percent of such accidents occurred at intersections. Other factors included road departure (36.5 percent), speeding (30 percent), an unrestrained occupant (25 percent), and alcohol (16 percent).